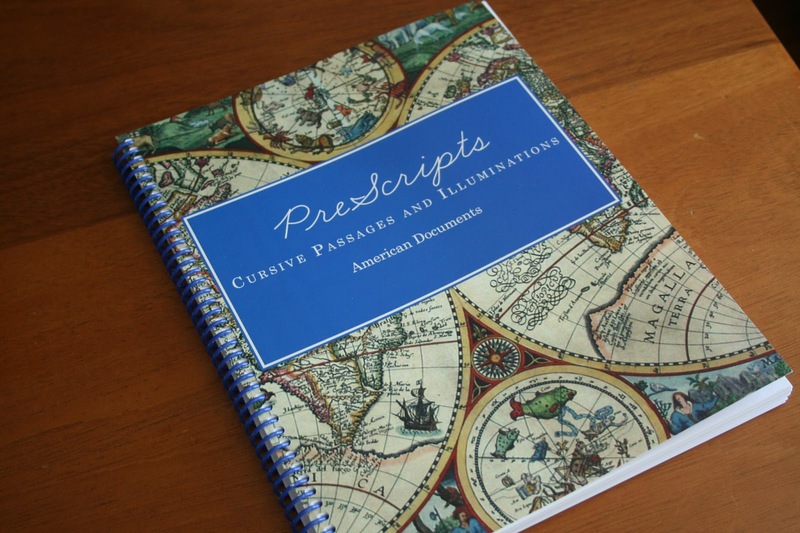 Prescripts gives your child practice in cursive using long passages from documents in American History. Your child will copy passages from documents and speeches such as The Mayflower Compact, John F. Kennedy’s Inaugural address, and The Emancipation Proclamation. Your child also gets a chance to practice drawing their own Illumination Letter or copying the one in the work book. The pages offer your child space to do his or her work or you can use a spiral note book. The authors intent is to use this consumable work book to help your child not to just write in cursive, but for it to be a beautiful work of art. This book is just beautiful. Its so beautiful that I could not let either of my girls to actually practice cursive in the book. I decided we would not write in the book but instead use it as a bookshelf reference in our American History section. So what I did was have Kiki get an empty spiral note book and do all her work in it, like a journal. I also suggested she write in the spiral any thoughts that came to mind after copying the passages. She has really wanted to practice her cursive and this really helped with not only giving her something to write, but also to become more familiar with documents, and their writers, from our American History. There are several different cursive writing styles out there and Kiki learned using Abeka and this was another reason to use a spiral note book so that she didn’t get confused by the style in the book by copying right under it. This worked out well for her and was easy. I had a thought on how to make this more challenging, and that would be to dictate to your older child and have them write it down in a note book. I can’t say that she enjoyed the actual act of doing the writing, but she did ask for practice with her cursive, and that is what she got. I only had to remind her and didn’t get any complaints about it. I was not able to get any photos of her work as she is very self conscious of her handwriting and art work of any kind. 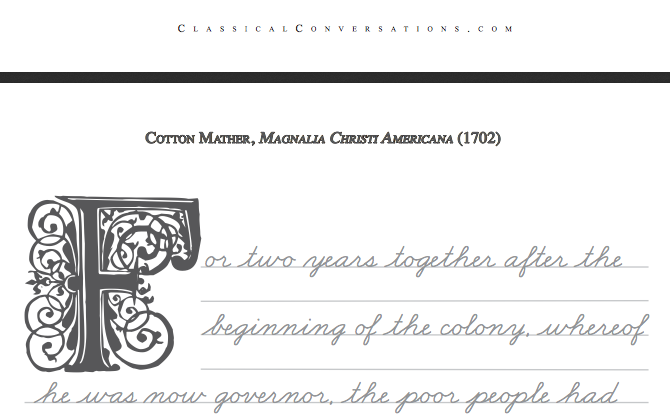 So what I have done is include a photo of part of a page for you to get an idea of the cursive style. This copy work book is going to come in handy for us since we just started our in-depth study of American History. It has allowed my daughter to get use to the “speaking” of those from our history so she will ease into our studies with some familiarity. I am glad that we were introduced to Classical Conversations through this review. We have been dabbling in classical education for the past few years. I think we will be able to utilize more of their products in our studies since we have decided to “go all out” for the classical education style this year. There are 3 lower levels of the Prescripts work books and you can find reviews for all 4 of them by clicking on this banner. 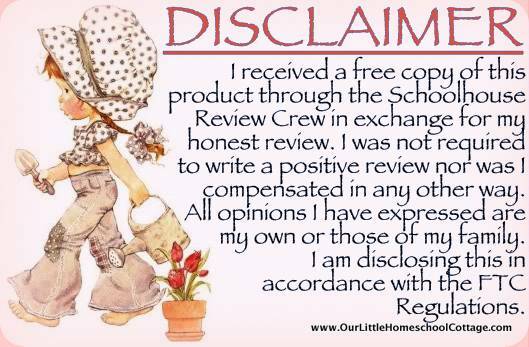 This entry was posted in HomeSchool Review, TOS Crew Review. Bookmark the permalink.